Feedback: 49 comments - leave yours! 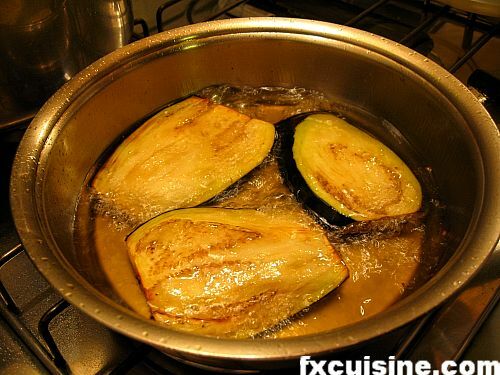 Frying eggplant is one of the trickiest things in Italian cuisine. The damned things will just drink up any oil you throw at them, ending up immobilizing your guests in bed for weeks like a python who ate a dog and can't move for days. But an eggplant properly fried is a marvel of soft, delicate flesh in a tasty browned capsule. I've tried many ways to fry eggplants - in a non-stick saucepan with little oil, in the oven, by pressing them to extract any oil they soaked up. 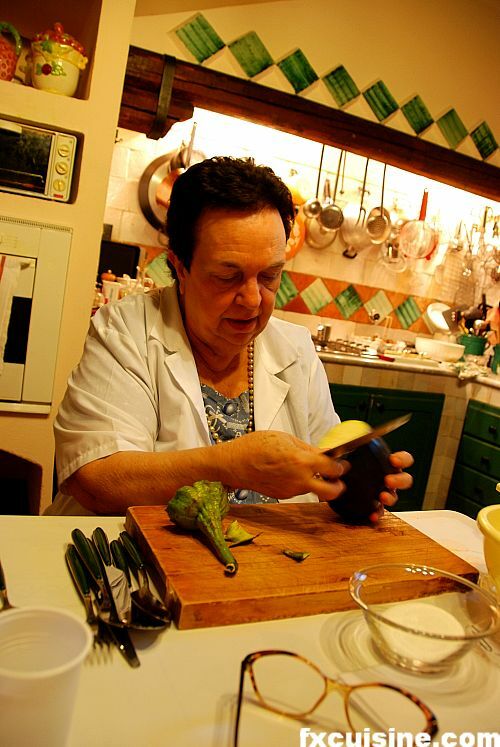 Everybody has some idea of how to do it, but when it comes to knowing how to fry an eggplant like a Sicilian mama, the buck stops with Eleonora Consoli, Mrs Consoli, from Viagrande on Mount Etna in Sicily, writes cookbooks for Sicilian readers, and she has her own food show on Sicilian TV. 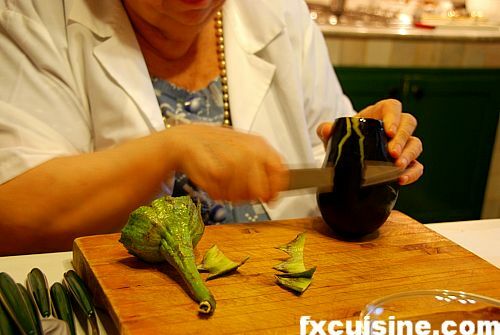 I managed to attend a private cooking class in her home near Mount Etna and asked her to show me how to fry an eggplant. Use black-skinned eggplants for best taste. 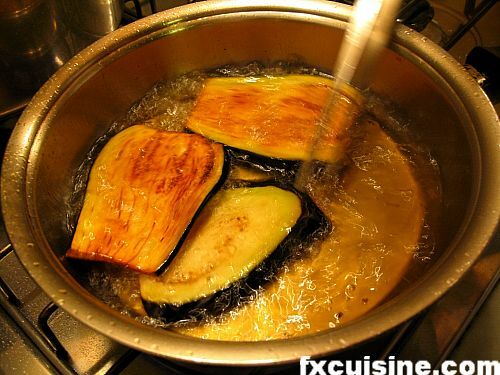 The skin is left on as it becomes very tasty when fried, but not so much with violet and white eggplants. Wash the eggplants, then cut the stem off as well as any damaged parts. ... then proceed with further vertical slices until you reach the other end. 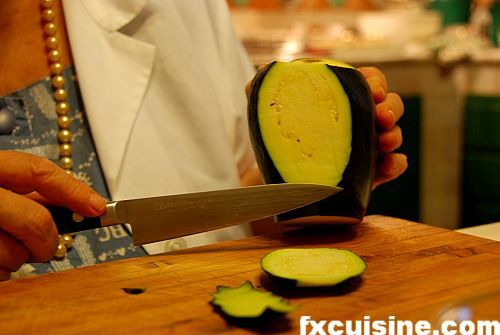 Rub each slice with salt on each side. Do not be afraid to use too much salt. 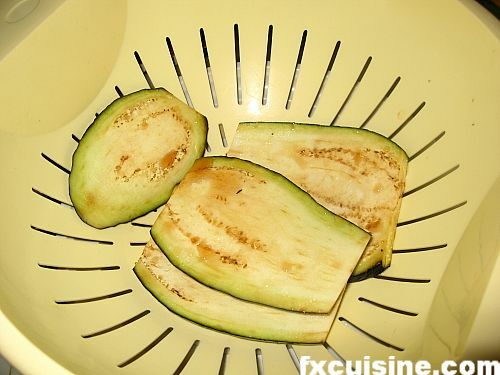 Leave the aubergine slices in a colander for 30 to 60 minutes. You'll see big drops of water form on the aubergines - that's eggplant juice drawn out by the salt through osmosis. The problem is that this process very much salts the aubergine. Since the water goes from inside the slices and out, you'd think no salt would enter, but it does. Now you have to wash each slice under running water and rub it, squeeze, strain, then wash again. If you don't do this, you won't be able to eat your aubergines. Now for the frying. You'd think that this being Italian cuisine an Italian home, they would use olive oil, right? Wrong. Olive oil does not withstand high temperature as well as other, less romantic oils. 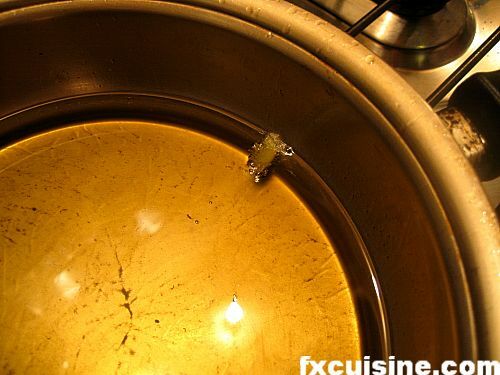 Professional chefs use either clarified butter or, like Mrs Consoli, grapeseed oil for high temperature frying. If you think that's not healthy, I'm not sure what business you have reading an article about deep-fried food, but know that Extra Virgin Olive Oil's health benefits disappear quick as the oil is heated up to its smoking point. Some grapeseed oils can withstand almost 400F°/200°C before starting to smoke, and they are clearly the right choice for this. Heat at least 1liter/quart grapeseed oil in a deep frying pan. Bring the temperature to about 170°C/330°F. You can drop little pieces of eggplant or bread in the oil - when it starts bubbling fiercely, your bath is ready. Rest eggplant slices one by one in the hot oil using pliers. DO NOT drop them in the hot oil or you'll finish the meal in the emergency ward. Just add as many slices as will fit in the pan's surface - you'll do the rest later. Do not let the oil heat enough to start smoking, but do not let it drop down too much either. Using kitchen pliers, check regularly the bottom side of the eggplant until they are nicely browned, then turn them upside down to cook the other side. 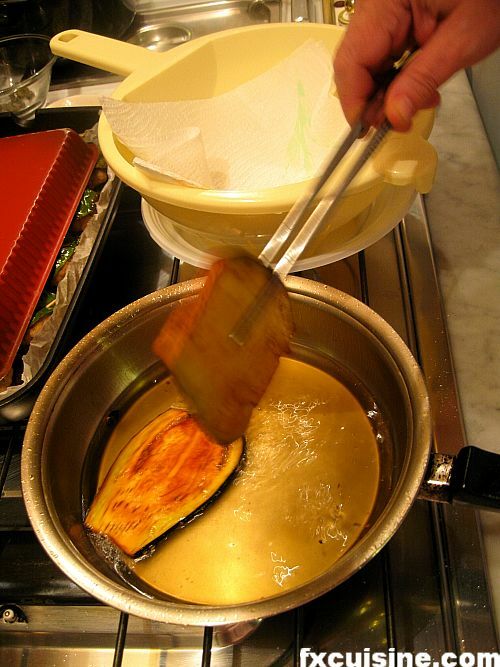 Remove the now cooked eggplant slices and lay them on abundant kitchen paper to remove as much oil as possible. Don't hesitate to carefully press with a quadruple layer of paper on top and press a little to extract more oil. Cover to keep warm and proceed like before with the remaining slices. Cutting them lengthwise is ingenious - I will try it out.Though I don't see the point in salting them to dry them out then drenching them in water :) But I guess I'll try that too. Great article, now I just have to figure out how to get my family to eat eggplant without me having to "disguise" them in sauces or stews! In the meantime, I'll bookmark this for when I'm home alone.Thanks for the tips. Lovely. I tried it today and it worked really well! We recently visited my cousin in Randazzo, Sicily. She prepared wonderful foods for us but because we didn't speak the same language, I don't know what all of the foods were. In the first course, there was an item that was cut into a wedge shape resembling a piece of pie but of course it wasn't. Do you know what it could have possibly been and how I would prepare it? I am going to attempt your fried eggplant as that was one of the selections in our first course. Thank you very much for your help. Thank you for the detailed clear instructions! Great post. Simple, yet those tiny details (slicing vertically, grapeseed oil, etc.) make all the difference. I am now not afraid of the dreaded, soggy, oily fried eggplant! Thanks, Dr. Aubergine! Jensenly, indeed Madame Aubergine is one particular lady, but if you do it her way, she'll reward you with that wet, caramelized flesh. awesome, I can't wait to cook like a Sicilian mama! Rick, Sicilian cookery is very rewarding if you can get proper vegetables, and it's quite economical too! The pictorial was wonderful and vivid. Thank you for the play by play. I have forwarded this to some of my friends who would benefit from this. Mrs Eiras thank you for your visit and glad you liked my article about eggplant frying! Unfortunately, I did not have the Grapeseed oil. I used, instead, Canola oil which seemed to fry the eggplant as close as your recipie. How many grades of "Grapeseed oil are there?, and which grade do I purchase?, since the only one I was able to find was "Roland" brand Grapeseed Oil which is a product of France ($10.00 for 1 pint. 0.9 FL OZ. )that I will be using soon. I will plan to stop and say "Buongiorno" on my next stop to your beautiful country of Sicilia. FX's answer→ Hello Joseph, in fact I think you can use really cheap grapeseed oil, the importance is really the highest temperature your oil can take before splitting into all sorts of unsavory organic compounds. Perhaps you can try and use a high-temperature thermometer to see what temperature you can get your type of grapeseed oil without breaking? I am by not means a gourmet chef, but I do dredge my eggplant in egg and breadcrumbs (parmesan) and serve it w/ whole wheat spagetti and marinara sauce. 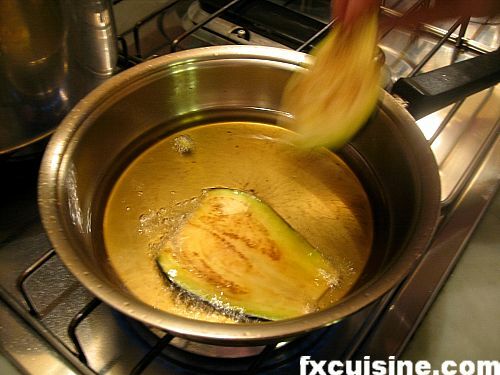 I also fry it in vegetable oil until lightly browned on the edges. I usually squueze it with paper towels as soon as it comes out of the oil, which helps alot. The key is making sure the oil is consistantly hot. My daughter found your website and emailed it to me. I am THRILLED that she did. My late mother's family originated in Sicily ~ Agrigento, actually. I have always longed to visit and perhaps see if I still have relatives there. Having access to your website almost brings me there. So my heart is now happy. Thank you for giving me a place that is so dear to my heart. FX's answer→ Thanks a lot Claire and have fun exploring your Sicilian roots! 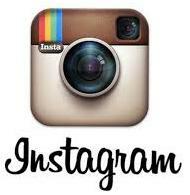 do you know if there is an american outlet where ms. Consoli's cookbooks can be purchased?? Hi FX, this is s great website/blog. I am a Siculo-Australian - Australian born with Sicilian parents. This is exactly how my mum fries eggplant. Such a great article on a simple topic. And those meatballs in lemon leaves – I grew up on them (but BBQed not baked). I think many people don’t realise how the simplest things in Italian cooking make all the difference. I love cooking and eating. And you have inspired to start my own blog. My parents have many old Sicilian recipes (they are 80 & 71 years old) which I would love to share with the world. Further, I have friends with mums with great recipes - the kind of dishes you will never get at any restaurants. For example, I have a friend with an East Timorese mum and Goan dad – his mum cooks some unbelievable curries and much more. I have another friend who is Lebanese – his mum cooks spectacular dishes beyond shish kebabs. So I am going to do it – I will start a website/blog. Do you mind if I email you asking for advice/tips? I don’t want to bore your readers with my questions here. Anyway – thanks for the great recipes, spectacular pictures but most of all for the inspiration. I will email you soon – if that’s OK? thank you for these great tips. 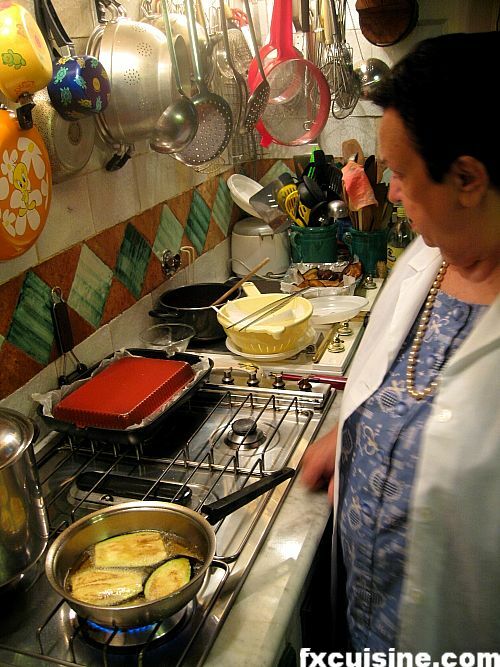 I will try once again in my quest to successfully fry eggplant like my mother-in-law in southern italy. I've watched and watched her but could never duplicate it. Your line about the python was hilarious and oh-so-familiar! that happened to me the last time I tried it. Thanks again! I will try your receipe, it sounds good. thank you..
Fantástico y utilísimo consejo y excelente redacción y explicación. Sólo me queda dar las gracias, quitarme el sombrero y acercarme a la huerta mañana sábado por la mañana a por un par de hermosas berenjenas y deleitarme con la receta. Lo único que no voy a poder utilizar es aceite de uva. ¿Dónde podría conseguirlo en Madrid? Muchas gracias de nuevo y un afectuoso saludo! This is a like a Dream come true!!!!!! A great article for someone who has never fried an eggplant. I had heard about salting or soaking, but didn't know exactly what to do. Also, I never suspected that which way the eggplant was sliced would make any difference. I would definitely return to you when looking for more info. Love eggplant, but always am looking for a better way. I found it here. It turned out wonderfully! Thank you. where have you been all of my life?? A PERFECT article; photos, resume of the chef, lots of tidbits. FX's answer→ Thanks Christopher, glad you liked it! I love the fine details you provide in your recipes plus the terrific pictures to help us visualize the products and procedures. Thank you so much. FX's answer→ Thank you Lois, I do love close up shots in recipes too! I wanted to try my hand at making the Greek dish Moussaka, but I've never been brave enough to try frying eggplant (though I've always loved eating it when done correctly). My Moussaka recipe said nothing about salting/draining the eggplant, but in the back of my mind I knew my dad had done "something" before frying eggplant. I searched on line & finally found this site. Now I'm not nearly as nervous about attempting the recipe. Thanks! FX's answer→ Good luck Rebecca! Is there a way to incorporate bread /corn flake crumbs into this recipe? I'd imagine dipping them in egg and then crumbs after patting out the salt soak. And yes, olive oil is no good for frying and grape seed is the best as it has a high smoking point. Charred food of any kind is unhealthy. FX's answer→ Well well, if you want to fry at 190C and don't like burnt carcinogenic food, then breadcrumbs are out ... but olive oil is back in! FX's answer→ Does this not burn the egg white? Salting and washing is the only way I can eat eggplant. For some reason, unless it is salted and washed, to take away some of the acids, the eggplant just doesn't agree with me. My sensitive gums become inflamed and I get heart burn (agido). Once salted and washed, I can enjoy them any way they're made. A Sicilian remedy for warts is to use the salt/eggplant sweat that comes out soaked into a piece of bread and bandaged to the wart. This stuff is caustic so I'm glad to get it out of the eggplant before eating. The eggplant becomes much more mild. FX's answer→ I have big trouble getting rid of the salt if I do that, it may depend on the type of egglant, some are more bitter than others. I have tried to find the best fried aubergine recipe longtime ago and finally I have got it thanks to You. Best reference cuisine website. Thank you for posting this. Now I know how my Sicilian grandma perfected fried eggplant. I knew it was cut length-wise and salted, but the entire technique escaped me until this. I just love Eleanora. 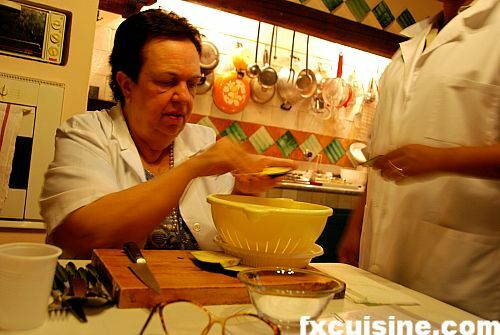 She bears a strong resemblance to my late Sicilian mother, who was also a phenomenal cook. FX's answer→ Thanks for the visit! 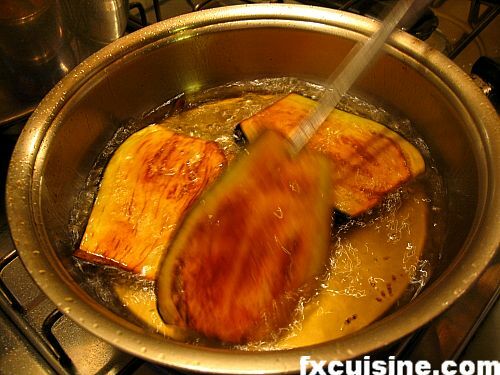 Now there is another article with improved methods for frying eggplants in the oven. Yes, I like this article very much. The instructions combined with the photos are superb. I'm trying this tonight. Cheers! thanks! i've been looking for a recipe for the perfect fried aubergine for a long time and this one nailed it. especially cutting the eggplants lengthwise seemed to be the right thing to do. they came out so yummy. FX's answer→ Good to hear it worked for you!